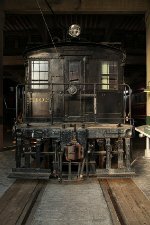 Description: A 60 ton boxcab built by General Electric in 1915, this electric box-cab locomotive had 1000 h.p. Serial number 5000. It was one of three units purchased and used by L & PS. 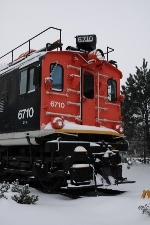 This unit was retired in 1966 and donated to the Museum of Science & Technology in Ottawa, ON It was declared surplus in 1995 and offered to the Elgin County Railway Museum. L-2 is on display at the Halton County Radial Railway Museum in Milton, ON and L-3 did not escape the cutters torch. Description: A note on the back by photographer Anthony H. Perles states "L&PS L2 at CNR interdange, while CNR 4-6-2's 5585 and 5143 (class K-3) get under way with a coal drag westbound." The L2 )along with its 2 other sisters) was built in 1915 by GE of Canada for a cost of $29,367. After retiring, it was stored for a museum which never materialized. L2 was later sold privately and moved to the Toronto area. In February 1997, L2 was moved to the Halton County Radial Railway following its donation to the OERHA. Description: London and Port Stanley L2 sits safely behind a fence. One day she would be in a museum. Description: Built by General Electric in 1915, this electric box-cab locomotive had 1000 h.p. This unit was retired in 1962. 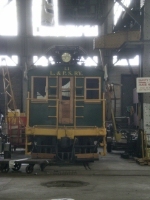 The Halton County Radial Railway Museum acquired L & PS L-2 in 1997 and it awaits resoration. Serial number 5001. Description: Canadian National Calumet Beach train at Mount Royal Station on Aug 25, 1966. The electric locomotives will come off at EJ tower. The electric locomotive are 101 and 100 and the diesels are 1298 and 1295. This is essentially an afternoon commuter train that continued on to Calumet Beach. Title: Box Cabs built in 1925! Description: Old GE Z1a electric boxcab used in the Mount-Royal tunnel on the CN Two-Mountains line from 1918 to 1995. Description: Static boxcab near the Deux-Montagnes commuter station. 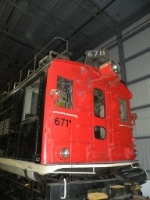 Description: CN 6710, a GE Z1a boxcab electric, was used in Mount-Royal tunnel from 1918 until 1995. It is now on display in front of Deux-Montagnes AMT station. Description: CN 6710 at Deux-Montagnes station. Description: Pairs of electrics were typical on commuter trains. Heres an overhead view of two leading a train out of the Mont Royal tunnel at Portal Heights. Description: On the left a 4-6-4T used on the Vaudreuil commuter line, on the right a GE boxcab used on the Deux-Montagnes commuter line.